CARACAS, Venezuela – In another year, Henri Falcon might be just another middle-of-the-pack presidential candidate in Venezuela. He’s far from the most popular opposition leader. He’s a dull speechmaker. The parties that back him are small. He’s managed to irritate both the left and the right. But a boycott of the race by Venezuela’s biggest parties means Falcon is by far the most prominent option on the May 20 ballot for those who want to unseat socialist President Nicolas Maduro – and polls indicate that is the majority in a country with spreading hunger and an almost worthless currency. Some of the same polls even have the former governor as the front-runner, with a double-digit lead over Maduro. The big question is whether that will matter. Most of Venezuela’s opposition, joined by the U.S. and much of the international community, is convinced it won’t – that the fix is in. The government long ago stacked the electoral council and judiciary with its supporters and has ignored the opposition-dominated congress that was chosen in 2015 in the country’s last relatively contested vote. The opposition’s most combative leaders are banned from participating, imprisoned or in exile. The presidential election, normally held late in the year, has been moved forward to the spring, leaving Maduro’s squabbling opponents little time to prepare. In response, the main opposition coalition has refused to field a candidate. Last week’s registration deadline passed with just Falcon and four relatively obscure figures signing up to challenge Maduro. 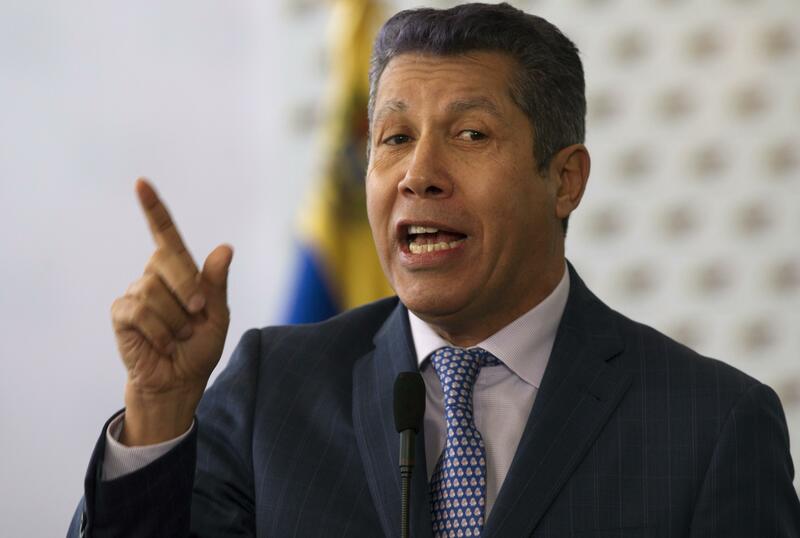 Falcon, 56, lacks the flair of many Venezuelan political figures. Maduro, a former bus driver and frustrated rock ‘n’ roller, mimics the impassioned, flamboyant speaking style of his mentor, the late President Hugo Chavez, who enthralled Venezuelans as he led the country on an oil boom-fueled march toward his version of socialism. Other more fiery opposition figures like Henrique Capriles and Leopoldo Lopez have galvanized huge anti-government street demonstrations. By contrast, Falcon comes across as a cerebral, competent manager driven more by pragmatism than ideology. Even while in the ruling socialist movement, he kept lines open to the business community that was being pummeled by much of the government. Now as an opponent, he calls for preserving generous social programs and subsidies started under Chavez. He has urged seeking help from the International Monetary Fund, a boogeyman to most of Latin America’s left, and his most noted economic adviser, Wall Street analyst Francisco Rodriguez, has called for adopting the dollar as the national currency as a way to halt the hyperinflation that has devastated the economy. The son of a school teacher and small-time farmer father, Falcon choked to the verge of tears remembering his humble origins at an event with investors in New York in 2016. The lawyer with four children often rises before dawn and laces up his running shoes to hit the streets in his hometown of Barquisimeto, a farming hub and Venezuela’s fourth largest city, where he served two terms as mayor. He was a non-commissioned officer in 1992, but wasn’t part of the failed coup led that year by the paratrooper officer Chavez, though he soon joined the Chavista political movement and rose through its ranks. Falcon first emerged as a renegade in 2008 when he unilaterally launched a run for governor of Lara state without Chavez’s blessing – a move that led to his brief expulsion from the socialist party. He was reinstated after pledging loyalty, Chavez recognizing his huge crossover appeal. He went on to be elected with 73 percent of the vote – more than any other gubernatorial candidate nationwide. In Lara, he earned high marks across the political spectrum as someone who was unusually open to dialogue with opponents, but also loathe to be seen alongside U.S. officials for fear of antagonizing his leftist base. But his Chavista heritage led to lingering suspicion among anti-government rivals. One opposition leader, Henry Ramos, accused him of “political asexuality.” He was banished from the opposition coalition after announcing his candidacy, with some hardliners suggesting he should be sanctioned by the U.S., which has backed the decision to boycott the vote. That mistrust, combined with anger at his decision to buck the election boycott and a widespread loss of hope among the opposition, could depress turnout, undermining his chances if the vote turns out to be fair. Partly for the same reason, he lost a re-election bid in October against a government loyalist by a landslide. Still, a recent survey by local pollster Datanalisis said most people identifying themselves as opposition supporters indicated a willingness to vote even under current conditions that they view as rigged. The Feb. 1-14 poll had Falcon leading Maduro by more than 12 points. It had a margin of error of plus or minus three percentage points. Vladimir Villegas, popular television talk show host who advised Falcon during his period of political awakening, said Falcon’s chameleon politics may prove the most feasible way forward for Venezuela, allowing a soft landing for Maduro should he decide to cede power. Published: March 5, 2018, 8:48 a.m.